Why Diverse Organizations Perform Better: Do We Still Need Evidence? You’ve probably heard that organizations with a focus on diversity have stronger organizational cultures – they have happier and more productive employees, and are more socially ethical than other organizations. You might have also heard that organizations with a focus on diversity perform better financially than organizations that do not invest energy in diversity programs, or in fostering a diverse workplace. Why, exactly, is this the case though? McKinsey & Company’s 2014 report, “Why Diversity Matters” answers just this, looking at the reasons why organizations with a focus on diversity simply do better, financially and otherwise, shining some data driven light on, well, why diversity matters. 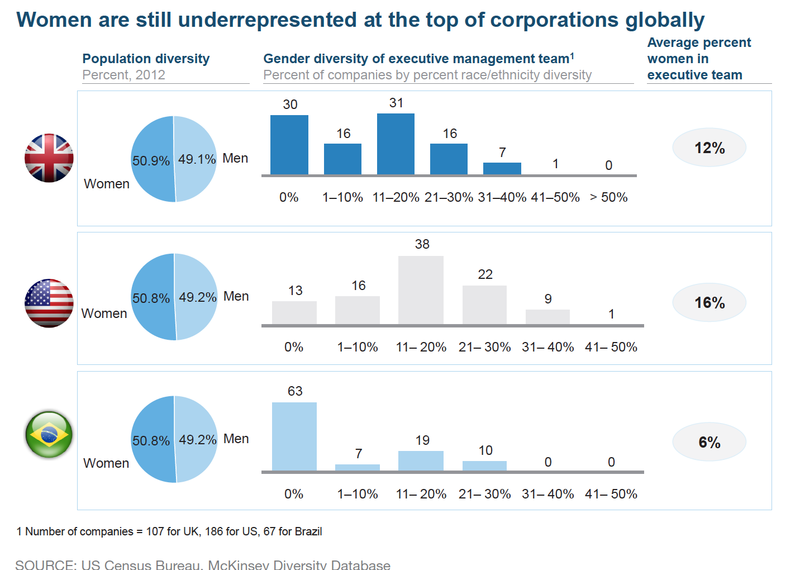 McKinsey’s report examines the relationship between the level of diversity (defined as a greater share of women and a more mixed ethnic/racial composition in the leadership of large companies) and company financial performance (measured as average EBIT 2010–2013). Their research is based on leadership demographics and financial data from hundreds of organizations and thousands of executives in the United Kingdom, Canada, Latin America, and the U.S, allowing for “…results that are statistically significant and…. 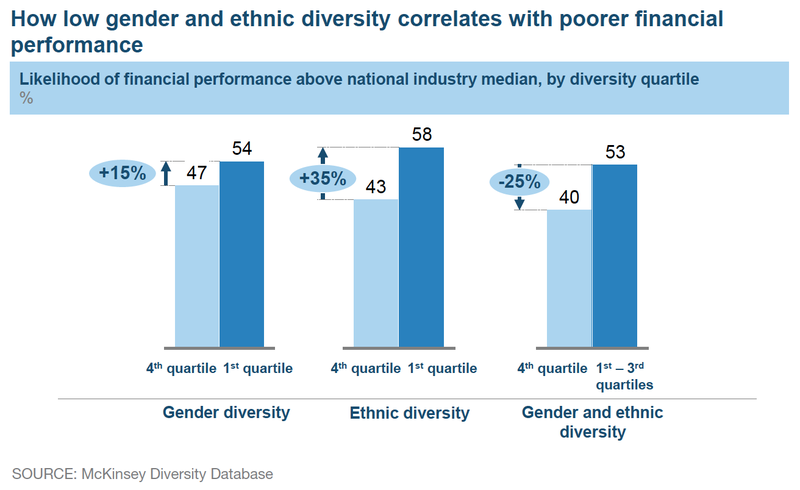 the first [analysis] that we are aware of that measures how much the relationship between diversity and performance is worth in terms of increased profitability.” Analysis of the data collected from 366 companies disclosed a statistically significant connection between diversity and financial performance, with organizations in the top quartile for gender diversity 15% more likely to have financial returns above their national industry median and organizations in the top quartile for racial/ethnic diversity 30% more likely to have financial returns above their national industry median. This pattern also held true in reverse, with organizations in the bottom quartile for gender or racial/ethnic diversity more likely to fall below the performance of the top-quartile companies and organizations in the bottom quartile for both gender and ethnicity underperforming (not just “not performing” but lagging) in comparison with the other three quartiles. 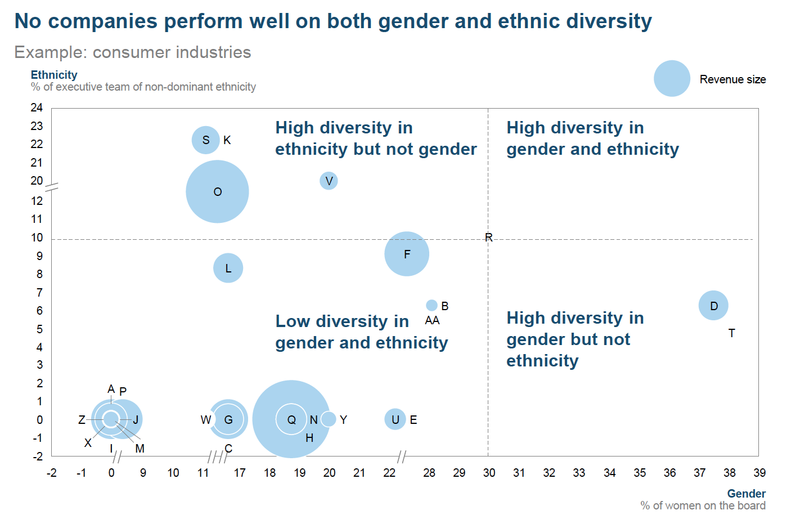 McKinsey’s research also noted a positive relationship between financial performance and diversity in leadership, although this varied by country, industry, and type of diversity (gender or ethnicity). The U.S, for example shows no statistically significant correlation between gender diversity and performance until women make up at least 22% of a senior executive team. Even once that point is reached, the relationship observed for US companies is still of relatively low impact: for every 10% increase in gender diversity there is an increase of 0.3% in EBIT margin. The UK boasts a much more significant relationship between gender diversity and performance, experiencing ten times the impact for their focus on gender diversity than U.S organizations (even after they’ve reached the 22% tipping point). The correlated benefit is an increase of 3.5% in EBIT for every 10% increase in gender diversity in the senior executive team (and 1.4% for the board). It is also interesting to note that while U.S. companies have made efforts in recent years to up the number of women in executive positions (progress is limited but measurable), the data show that less attention has been given to the attainment of racial and ethnic diversity. In the war for talent, diversity increases not only an organization’s sourcing pool but attracts talent that has shown to place significant value on diversity (such as Millenials). Additionally, because groups targeted by diversity efforts are usually underrepresented, they are often great sources of desirable talent. McKinsey & Company’s report cites a recent study that found, on average, lesbian, gay, bisexual, and transgender (LGBT) recruits tend to be more highly skilled and more likely to have advanced degrees. By focusing on diversity, organizations align themselves with an increasingly heterogeneous customer base, enabling stronger bonds with customers. Workplace diversity increases employee satisfaction and fosters positive attitudes and behaviors and creates better decision making through combining diverse groups of thinkers. These organizational aspects that diversity bolsters ultimately make up the foundation for organizations that perform better financially. As the workforce becomes increasingly global, diversity is only going to increase in importance. Regulators in some European countries have already introduced diversity targets for boards, such as those set out in the UK Equality Act 2010. Despite the importance of diversity, many companies’ approaches are still very one-dimensional, opting for just a single diversity program to cover all aspects of diversity: racial/ethnic, gender, and sexual orientation. This may be why, on a large scale, companies often make progress in only one area of diversity. McKinsey & Company’s research suggests that this one-dimensional approach to diversity results in a focus on a particular category rather than the opportunity as a whole. They advise that organizations should instead adopt tailored programs and make more targeted efforts within specific areas of diversity, believing that these will be necessary to make measurable progress and ensure relevance to business goals. It does seem odd that we’re still making a statistical case for what everyone knows to be true: diverse thought, experience, outlooks and cultures make for stronger solutions, more rapid innovation, more engaged employees and customers, and better all around performance. I guess more evidence doesn’t hurt. Consistently referencing positions based on their dominant group can reinforce the belief that those people holding the position should be from that group, causing those in the minority to feel excluded, divided from the team, and set apart from power structures at the top of their organization. Catalyst’s study points out that gender and race/ethnicity are two of the common bases for feeling like “the other,” but that people of all groups – regardless of whether their racial/ethnic identity reflects that of the majority in society as a whole – can feel different from their workgroup based on race/ethnicity, and that feelings of otherness can really stem from any area of self-identification. For example, besides gender/race/ethnicity, Catalyst’s research also looks at data from LGBT and Expatriate individuals, who often reported experiencing feelings of “otherness.” The study’s findings come from a sample of 2,463 MBA graduates (33% women and 67% men) working in corporate and non-corporate firms in the United States at the time of the survey. Data from the study highlight some surprising and troubling effects of perceiving oneself as an “other.” Women respondents who identified as feeling racially/ethnically different were the least likely to be at the senior executive/CEO level (10%) compared to men who felt different (19%) and those who did not feel different (16% women; 25% men). It’s important to note, too, that the women who identified as feeling racially/ethnically different had no less experience or qualifications than those in the position. Additionally, Catalyst’s survey identified that women who perceived themselves as “others” experienced fewer promotions: 48.2% had received two or more promotions versus 55.6% of women who did not feel racially/ethically different. 51.4% of men who felt racially/ethnically reported receiving two or more promotions versus 58.4% of men who did not feel racially/ethnically different. Catalyst’s research also found that people who feel different from the majority in their workgroup are less likely to be mentored by C-suite or senior executives at their organizations. This is troubling considering that previous research by Catalyst found that the level of one’s mentor often predicts advancement (the more senior a mentor the more able they are to recommend for high-level/visibility positions). Of those surveyed, only 58% of women who felt racially/ ethnically different had mentors who were CEOs or Senior Executives. This is compared to 71% of women who did not feel different, 72% of men who did feel different, and 77% of men who did not feel different. Workplace exclusion or feelings of otherness based on racial/ethnic differences can also affect individuals beyond their organizations. Women who felt racially/ethnically different (46%) were more likely to downsize their dreams and aspirations than women who did not feel different (33%) and of those who felt racially/ethnically different, women were nearly twice as likely as men (25%) to downsize their aspirations. Women who identified as feeling racially/ethnically different and had children and spouses had an even a higher likelihood of downsizing aspirations. This data provides some serious food for thought for organizations. What is the impact to your organization if talented employees are experiencing feelings of “otherness” and exclusion? Organizations with employees experiencing this are likely missing out on enormous amounts of talent and innovation, not to mention losing important values and aspects of a great workplace culture. Use this research to keep in mind the message we send by identifying roles by the dominant group, and take a look at what policies and programs (both formal and informal) your company has in place to ensure that those with backgrounds that differ from the majority in the workgroup feel that their workplace is an inclusive environment and have equal access to mentorship at the top, fair evaluation, and promotions.